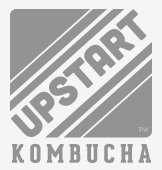 The delicious, refreshing soda alternative Low in sugar, low in carbs, made from organic ingredients, Upstart Kombucha has all the benefits of tea. Looking for an afternoon pick-me-up? Looking for a refreshing drink after a workout? Treat yourself to a healthy option, and reach for an Upstart!